Halloween is in just two short weeks, which means you may be looking for Halloween costume ideas. 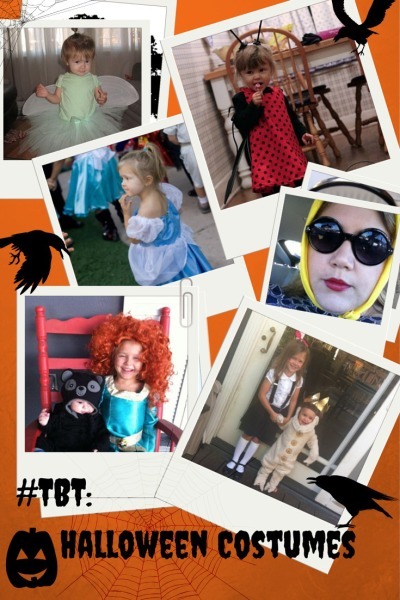 Or you may have children like mine, who start planning next year’s Halloween costume on November 1. I have many failures as a mother. I am not very tidy. I don’t volunteer in my kids’ classrooms. I refuse to iron anything. I don’t check my 7 year old’s homework (not that I could do anything with it – it’s all in Spanish). My kids eat fish sticks for dinner not-infrequently (don’t tell the home cooking police). But I have two points of pride: Homemade birthday cakes, and homemade Halloween costumes. In the collage above, you can see the Nuni’s creations over the years. I am not a great sewer, but I’m good enough for Halloween. From the top, Tinkerbell (I made the tutu! ), a Ladybug (made the jumper, with black tights and black wings and homemade antennae headband), the cutest lopsided Cinderella ever, Bernadette (this was me last year, from this book – easiest Halloween costume ever), Merida and baby brother (my mom sewed the Merida dress, and the baby was in a bear hat and black pajamas), and last year’s Eloise and Max). 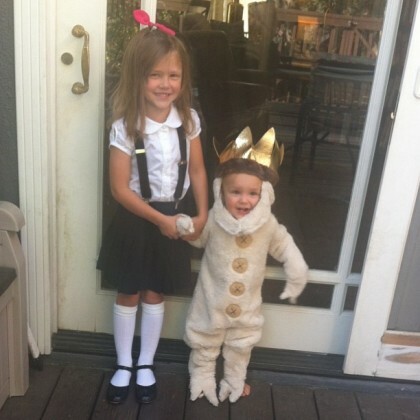 Max (from Where the Wild Things Are) breaks my homemade rule – this is a PBK costume that I love so much I bought it when Bootsy was tiny (on clearance, after Halloween) and he’s wearing it again this year. 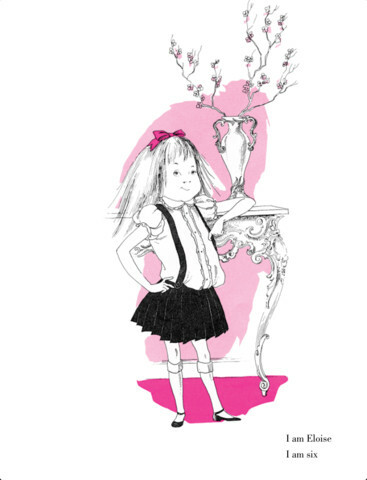 Eloise is my favorite genius costume idea. If you’re not familiar with Kay Thompson’s Eloise (with drawings by Hilary Knight) you should go out and read it right this second. I’ll wait. OK, back? I leaned hard on the Nuni to be Eloise last year when she was six, because Eloise after all is six, and it remains and will remain my all time favorite kid’s Halloween costume. The great thing about this costume is that it was very easy to put together black pleated skirt, black suspenders, white blouse, knee socks, black mary janes and pink bow – but you can wear all of it again! The Nuni wore the skirt and blouse to school as part of her uniform for the rest of the year, and the knee socks and shoes went into the regular rotation, too. We even got a little stuffed weenie dog to hold. We’ve got great things planned for this Halloween too, and I’ve got to log some sewing time this weekend. The Nuni is requiring me to dress up this year, too. What about you? What are your Halloween plans?